Look Younger with Eyelashes?! Yes! We all want to look our best. And most often looking our best means reversing or slowing the natural signs of aging. We want to look on the outside as young and vibrant as we feel inside. 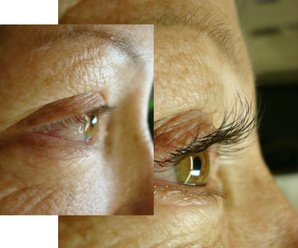 One of the first places many people complain about noticing the signs of aging is around the delicate eye area. The skin in this area is the first to wrinkle, and as we continue to age we begin to lose the eyebrow and eyelash hairs that once framed our faces in our youth. The need to preserve our youthful apperance has driven many to extremes. Pushing the boundaries not only of our wallets, but in many cases our health and safety. Scientific studies have shown that the eyes set the “tone” for our face. Why not make that tone one that you want to hear! Nothing sings of youth quite like long, thick eyelashes. A Natural, Glam, or Diva set of our Happy Lashes eyelash extensions immediately brighten and freshen the eye area creating a more youthful appearance without the potential dangers, and expense associated with invasive surgery. Why take the risk when you can try Happy Lashes eyelashes extensions and experience an almost instant transformation during a restful spa like experience! We know you’ll love the results, but don’t just take our word for it… check out our many before and after transformations and see for yourself!